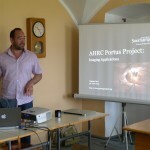 Ten days ago three members of ACRG visited Estonia to participate at the archaeological field-school. It was organised by Marge Konsa from University of Tartu who also spent several months in Southampton as a visiting research student. Field-school took place in Lihula, a tiny village in West Estonia. County of Läänemaa is filled with great archaeology, so we could enjoy little of it as well. I gave a short intro into sequential photography, including phogrammetry, RTI, panoramas and time-lapse capture. Graeme Earl shared the Portus experience and how we use photographic and other imaging techniques there. 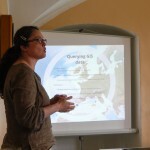 Patricia Murrieta (now researcher at University of Lancaster) gave introduction to GIS. It was a great experience for all of us.